Consider having a mehndi henna party, join me for a workshop with women in your community, or simply enjoy receiving the healing art for yourself in the comfort of the studio. Parties – $120 per hour. Individual sessions priced by design at the rate of $25 per 20 minute increment. Mehndi, the ancient art of painting on the skin with henna, beautifies the body, rejuvenates the spirit and celebrates the joys of creativity and self expression. More than just a temporary tattoo, mehndi offers us a way to participate in a centuries -old tradition still practiced in India, Africa and the Middle East. 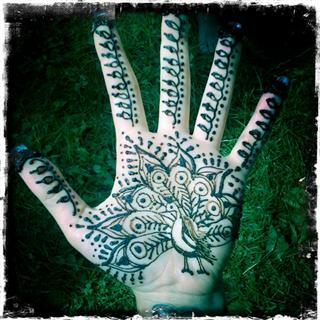 Mehndi is the word in Hindi used to describe henna, henna painting and the resulting designs. Henna painting is an ancient cosmetic and healing art whereby the dried leaves of the henna plant are crushed into a powder, then made into a paste that is applied to the body to safely dye the skin. This is done in elaborate patterns and designs, traditionally on the hands and feet. The result is a kind of temporary tattoo, often reddish brown in color, which will last anywhere from several days to several weeks. The process is absolutely painless and in no way harmful to the skin. 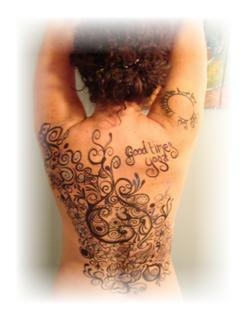 In fact, henna is said to condition the skin as it beautifies the body. Mehndi is a sacred and loving art form. A celebration of womanhood, community and artistry. A gift to one’s self, friends and family. Celebrate a young woman’s transformation into the circle of women, a woman’s role as a new mother, wife, single status or simply her, your friends, your mother, YOU. 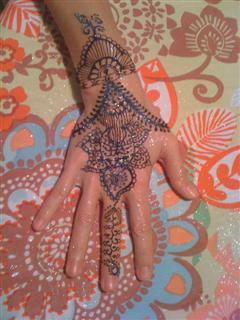 No matter how few or how many guests there are, henna parties are memorable, intimate, joyful and full of creative energy. Mehndi seems to have a transformative effect on a group of people, young and old alike. It asks a woman to have a dialogue with the universe, and it provides the words by which to have that dialogue. 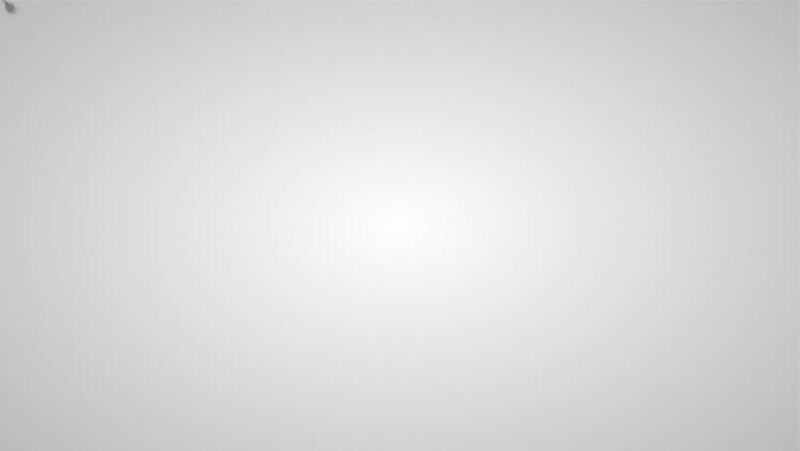 In India there is a special term – shringar – that is used to describe the beauty of a woman’s creativity. The concept of shringar is a particularly lovely one. A woman displays her shringar in the act of creative expression. It is the power of beauty beneath the surface and mehndi is one of the many ways that such beauty is made manifest. The art and language of mehndi celebrates and heals the hands and feet. 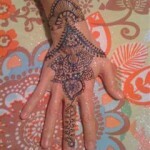 Henna stains the palms and soles a deeper and more lasting color than any other part of the body. It is easy to take our hands and feet for granted. They serve us constantly. They are facilitators – those with which we give and receive, travel and carry ourselves upon. Experiencing the art of mehndi, it focuses our attention on the sacred nature of the hands’ and feet’s activities. Here, instruments in turn becomes canvas. In India, the feet of a woman are recognized as a point of divine contact; the place where the human being and the earth meet. This is considered a holy junction. The art of mehndi celebrates this union. As well as a celebration, mehndi provides a much needed vacation for the canvas of the feet and hands. It requires that the recipient be free of all responsibility for the duration of the application, which can last as long as a full day and evening. Taking the time to do this is in itself a healing thing, and when done in the proper spirit, it can be a rare and welcome break form the hectic routine of day-to-day life. It involves important elements of massage and meditation, stillness and concentration, as well as sustained physical contact with another person.